Marvel Television has released a new image from the third season of Marvel's Agents of S.H.I.E.L.D. 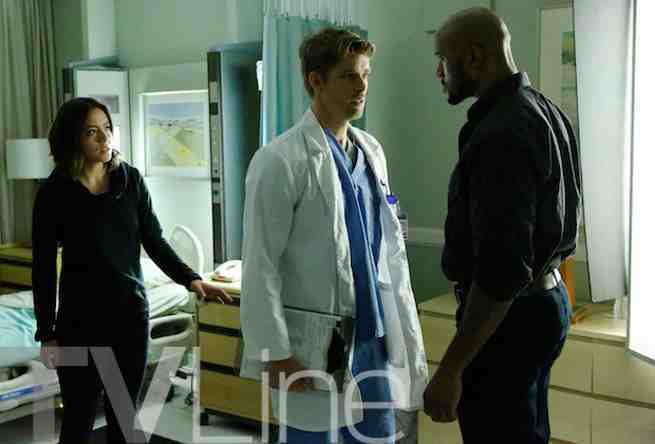 Released at TV Line, the new image shows Daisy “Skye” Johnson (Chloe Bennet) observing an argument between the Inhuman Lincoln Campbell, a.k.a. Sparkplug (Luke Mitchell), and the new leader of the S.H.I.E.L.D. team tasked with dealing with Inhumans, Mack Mackenzie (Henry Simmons). Executive producer Jeff Bell revealed that S.H.I.E.L.D. won’t be the only organization with an interest in the Inhumans in Season 3. "These 'aliens' are popping up all over the world, without anybody to guide them, so there's a lot of fear and paranoia," Bell explains. This leads to a confrontation between S.H.I.E.L.D. and a new government agency called the Advanced Threat Containment Unit (ATCU), led by Constance Zimmer’s new character. "They really are against us, which forces our team to come together," says Bell, "whereas we were splintered last season." Marvel's Agents of S.H.I.E.L.D. Season 3 premieres Sept. 22 on ABC.